Around this time of year, it’s pretty safe to say that most of us are in full pumpkin mode. Pumpkin is one of my all-time favorite flavors and I can’t seem to get enough of it. Well, you’ve probably seen, heard of, or drank a pumpkin spice latte from Starbucks® before. But have you ever thought of making that delicious fall beverage AT HOME? I’m always surprised when I hear that people haven’t made a pumpkin spice latte at home before because it so simple, so easy, and way cheaper than what Starbucks® will charge you. Not to mention how much healthier it is for you. There’s so much less sugar and absolutely no artificial ingredients in a homemade pumpkin spice latte. This paleo pumpkin spice latte is made with real ingredients, like pumpkin puree, coconut milk, coffee, and coconut sugar. 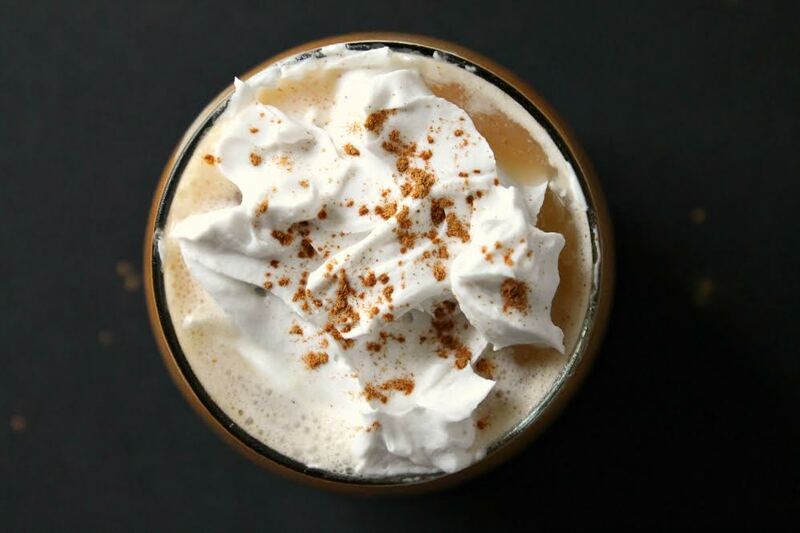 The flavors of the coffee, the pumpkin, and the spices meld together so perfectly to create a beverage you’ll want to drink everyday of the week! It’s incredibly smooth, creamy, and downright delicious! This recipe uses coconut sugar as a sweetener, but you could alternatively use maple syrup, which may add a maple flavor to your latte. I’ve tried it before and it was phenomenal, but feel free to use whichever sweetener tickles your fancy. I love to dollop on a little bit of homemade coconut whipped cream and sprinkle a little extra nutmeg on top, but that’s totally optional. You can also enjoy this pumpkin spice latte warm or iced (I’ve had it both ways and it’s equally amazing). Note: For those who can’t tolerate coffee, try making this with Jessica’s homemade herbal “coffee” blend. Scoop the solids off of the top of the can. This can be used to make your coconut whipped cream for the topping. Pour the remaining liquid in the can into a bowl. In a blender, combine the bowl of coconut milk with the coffee, pumpkin puree, coconut sugar, cinnamon, and nutmeg and blend until smooth. Pour half of the mixture into two glasses. 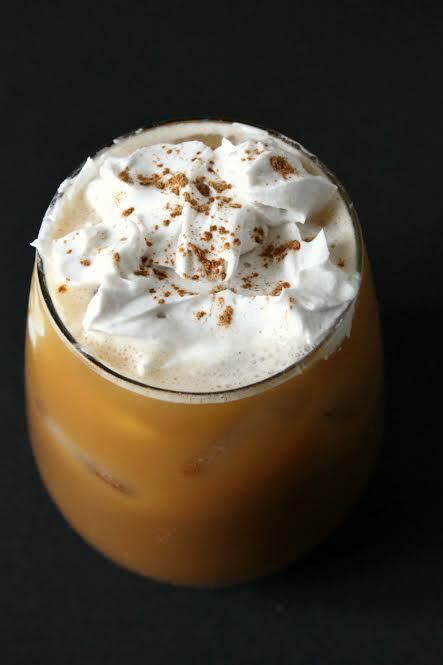 Garnish with whipped coconut cream and a sprinkle of cinnamon, if desired. Want to Make Your Own Gourmet Herbal Coffee Blends & Support Your Stress Response, Adrenals, Thyroid, and Whole Body Through Herbs? Because of this, I wanted to add in a section into this post about the benefit of using herbs with chronic illness. Adaptogens are by far one of the most used herbs when it comes to working with people who have low energy, fatigue, and overall imbalance in the endocrine system (thyroid, adrenals, and blood sugar). While the benefits of adaptogenic herbs extend far beyond just supporting that one system, this tends to be one of the main reasons people turn to adaptogenic herbs in the first place. That said there are a lot of other herbs out there that offer amazing support for the body, especially those dealing with chronic illness which is why I wanted to share this section today. If you are dealing with any type of chronic illness, I’m sorry to break it to you, but caffeine may not be your best friend. 🙁 While you can find lots of info online in both the pro- and the anti-coffee camps, the fact of the matter comes down to the fact that are a lot of people dealing with chronic illness, especially thyroid and adrenal problems, that simply cannot tolerate coffee and caffeine. While those with sluggish adrenal glands tend to feel run down and in need of a regular pick-me-up (like coffee and other caffeinated beverages), in the long run, caffeine can do more harm than good while you are healing. I go into the “whys” around caffeine and your adrenals in this detailed post here. In addition to the caffeine, there are other constituents, molds, and mycotoxins that can show up in coffee that some people find they react to and can further exacerbate the toxic load on the body. When I was diagnosed with autoimmune disease and adrenal fatigue, one of the first things that had to go was coffee. In addition to dealing with these issues, we suspected that I was having some detox pathway sluggishness so we wanted to also focus on supporting the liver and lymph systems. Most people who are dealing with chronic illness are also going to have issues with detoxification of the body, which is why herbs can play such an important role. To be honest, I never drank coffee because of the caffeine. I drank coffee for the taste and aroma, as well as the emotional experience I felt to my morning cup of joe. For me, it was a ritual that I looked forward to every day (and sometimes multiple times a day). Whether I was brewing it at home or going to my local coffee shops, the experience was one that I clung to tightly. But, when I was faced with new health struggles, I knew I had to do whatever I could to support my body and give it the tools it needed to heal. Giving up coffee and caffeine was one step in this direction. I turned to the coffee substitutes on the market in a desperate attempt to recreate the ritual I had grown so fond of, but nothing ever tasted the way I wanted it to. Nothing ever gave me that same experience that my cup of “real” coffee did. I knew there had to be something better, but I simply could not find it on my health food store’s shelves. Necessity is the mother of invention so that is why I created my own coffee substitutes. They were made with organic, sustainably harvested herbs with zero grains, zero gluten, and zero caffeine. Just herbs. 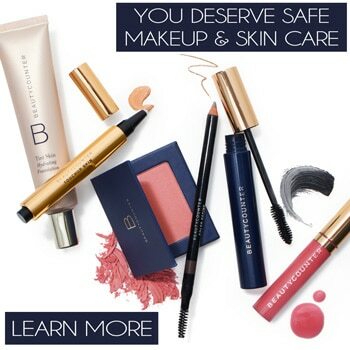 When it came to creating these blends, if I could get something to not only tasted amazing (and helped me recreate my dearly loved ritual), but also did amazingly supportive things for my body, then it’s a no brainer! I sold these pre-made blends on Etsy for awhile and the demand was more than I could keep up with. People literally LOVED these blends and were stunned at how much like coffee they actually tasted. Customers who had been dealing with a variety of chronic illnesses had given up coffee to heal their bodies, but like me were deeply missing their morning cup of joe ritual. After careful consideration and work with some highly experienced advisors, I decided to stop selling the pre-made blends and instead share my proprietary recipes in the form of an eBook. That way I could arm people with the knowledge and recipes they needed to make their own caffeine-free, gluten-free, grain-free blends in the comfort of their own home. 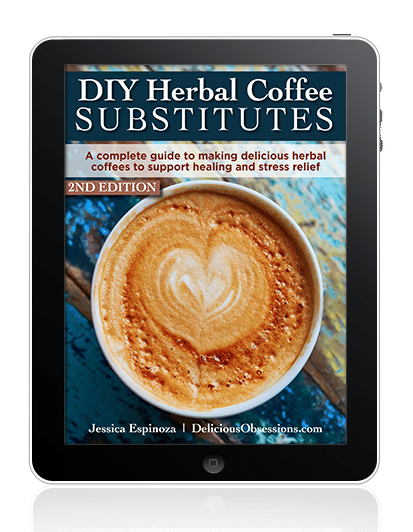 That is why I created the best-selling DIY Herbal Coffees eBook: A Complete Guide To Making Delicious Herbal Coffees to Support Healing & Stress Relief. All of my proprietary herbal blend recipes to you can craft a homemade herbal cup of “coffee” at home. A ton of researched information about coffee’s impact on the health of those dealing with issues like adrenal fatigue, blood sugar dysregulation, autoimmune disease, thyroid disease, and any other chronic illness. Information about all of the herbs used, why I selected them, how to source them, how to prepare and store you “coffees”, and much more. Access to your own personal coffee shop where I show you how to recreate your favorite coffee shop drinks and pastries with wholesome, nourishing real food ingredients. No junk here. Only real food. 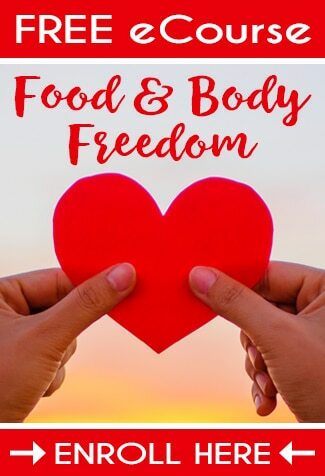 This book truly is a comprehensive guide to supporting your health, reducing your stress, and bringing a little something special back into your healing journey. You can learn more and download your own copy of this revolutionary wellness guide here, or simply click on the image below. Looks amazing! I love pumpkin lattes.